Montana Test.com - Results for: ChefsChoice/Edgecraft Pro Sharpening Station M130 Sharpener, Hunter Green! 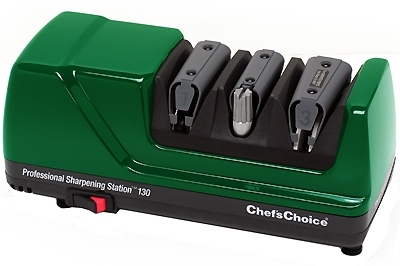 ChefsChoice/Edgecraft Pro Sharpening Station M130 Sharpener, Hunter Green! The M130, presents all your sharpening options in one compact appliance. It professionally sharpens, steels or strops all brands and types of knives; straight edge or serrated, kitchen, Asian style, sports and pocket knives in seconds. Three stages make it possible to obtain a "better than factory" edge quickly and effortlessly. Stage 1, using 100% diamond abrasives, sharpens the edge. Stage 2 is a super-hardened miniature steel that develops a shaving sharp edge with ultra-sharp microscopic teeth, providing a superior edge "bite". In stage 3, a revolutionary flexible stropping disk polishes the edge to hair-splitting sharpness. Using these stages in different combinations produces custom edges, suited to a particular cutting task. Built-in, high precision, user friendly elastomeric angle guides guarantee fool-proof sharpening.